I love pictures of prayer flags. This one is really beautiful. Neat framing. Very nice rainbow its awesome when everything cooperates once in a while. 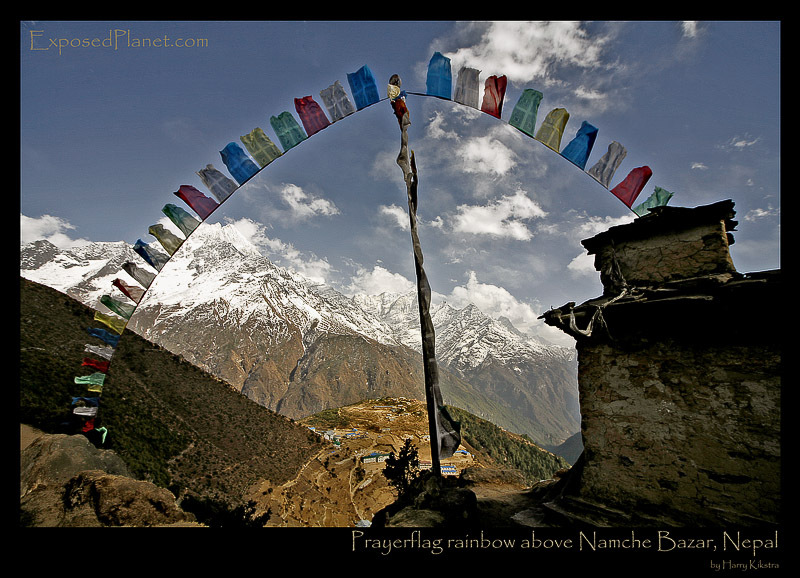 The story behind "29th Prayerflags Rainbow above Namche Bazaar, Nepal"
Namche Bazaar is a strange place. Created on top of a plateau, where a bit lower 2 river valleys merge. For centuries, people from many villages around have come here to sell and trade their goods and produce in the weakly market. Nowadays the main income comes from the stream of trekkers and climbers, on their way through the wonderful Khumbu valley, towards Mount Everest and the village is filled with guesthouses, restaurants, gifs an gear shops and even Internet cafes. Still there are many authentic Buddhist structures to be found everywhere, including this old Stupa on the way to Khumjung village, where a strange wind flow created this rainbow of prayerflags, fitting to the surreal atmosphere of the area.